Our culture is obsessed with youthfulness and beauty. Thousands take to the high street in search of an elixir, with more than two thirds of consumers admitting they are willing to purchase products even when watching their spending. Beauty is no longer a luxury. Consumers flock to stores seeking enhancement as a way of gaining added confidence. Cosmetics aisles are filled with teenagers trying on makeup to look older, while further along the aisle shoppers are in search of the best anti-aging products. The feeling of not matching up to the ideal of image perfection promoted by the media leaves consumers emotionally vulnerable, driving them back into stores in search for their preferred quick fix. Beauty brands are big innovators and their success in refining their respective product ranges commands strong loyalty. So, how can brands att ract audiences away from competitors, and more importantly, how can they stave off the competition snapping at their heels? Two leading brands have adopted different ways to stand out in the competitive marketplace. From cutting edge tech that prioritises experience over purchase to utilising friendly ambassadors that can provide expert advice, the beauty industry is a prime example of how to position a physical store for the modern shopper. Charlotte Tilbury, an experiential adventure of self-discovery, envelopes the shopper in a fantasy world of glamour, complete with upholstered velvet seating, lavish gilded mirrors lit by in-vogue chandeliers beneath a canopy of gold palms. The brand is known to appeal to a younger demographic, but the escapist instore experience draws in the curious of all ages, giving the brand a real advantage. The beauty and skincare brand offers deep engagement, mixing education with entertainment to deliver perfect instagrammable moments to share with friends in real time. 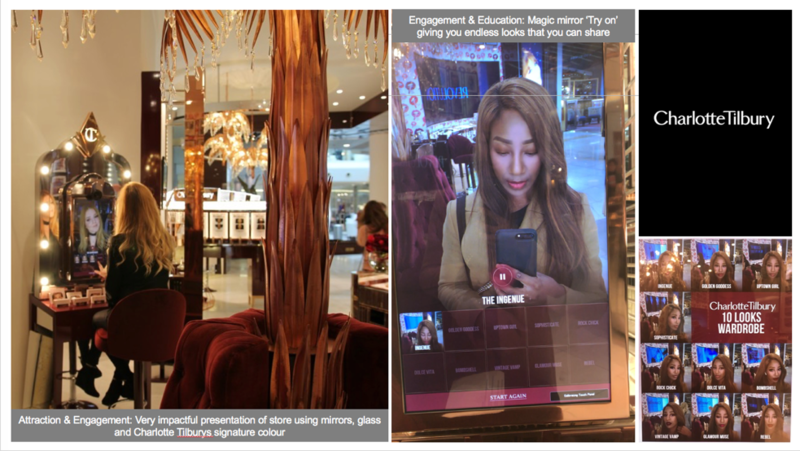 From magic mirror installations, enabling commitment-free exploration of the range, to Augmented Reality that encourages experimentation, allowing shoppers to try multiple makeover looks, Charlotte Tilbury is the beauty utopia shoppers have been waiting for. Max Factor, on the other hand, relies on its iconic status. The brand’s credentials act as an attraction, highlighting its heritage and reputation. The brand banks on its expert advice, offering little in the way of entertainment. Known as ‘the makeup of makeup artists,’ Max Factor takes cues from the film industry. Glamour shots are framed in lights and product displays echo the expanding makeup boxes that are the daily tools of professionals. 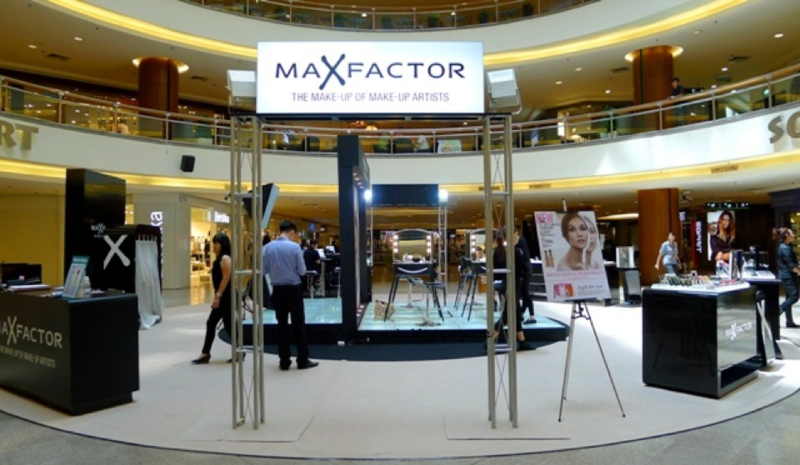 This positioning allows Max Factor to boost brand awareness and offer expert advice and tuition, while aiding in building relationships with consumers. As the brand’s reputation lies heavily in its ‘trusted experts’, brand ambassadors can encourage trial of new products and upsell to a new range, dramatically increasing basket spend. However, the personal attention required to deliver this kind of instore experience can also be a weakness. Customers need to book appointments for their makeovers, which can be off-putting for younger consumers and casual shoppers that are not yet loyal to the brand. So, what can brands learn from the beauty industry? Beauty brands do not have the monopoly on brand ambassadors. Apple’s geniuses are a great example of how advisors can demonstrate expertise, offering advice and helping shoppers find the perfect product to fit their lifestyle. This instore experience cannot be replicated online, giving physical stores an advantage over their digital competitors. Advisors are the currency of the moment, as they enhance the instore experience, giving consumers a reason to return time-after-time. Content however needs to remain on-trend, which comes with certain associated costs, or the experience might become a one hit wonder that fails to satisfy on future visits. Apple also hosts a programme of educational seminars. Creative professionals are brought in to share their expertise, simplifying complex processes for tech newbies. If the high street is to survive, retailers need to offer shoppers something that cannot be found online. Rethinking how to most effectively use physical spaces therefore needs to go beyond remodelling. Experience is key. Human interaction, a dash of entertainment powered through AR and VR, and expert advice offered by friendly brand ambassadors are all powerful ways to draw customers instore. Embracing this path is sure to see the high street store make a comeback.